If you want to invest in the most realistic golf hitting mat, look no further, the PureShot Ultimate Pure is the mat for you. It is a commercial grade golf mat made to withstand many years of heavy use. PureShot Golf Hitting Mats are manufactured with the best materials in the industry. The PureShot "Ultimate Pure" golf hitting mat has an extra thick 5/8" rubber backing and extra thick turf top. The PureShot Ultime Pure golf mat is designed to provide the most accurate feedback, feel, and durability. All PureShot Mats are made with industry leading synthetic turf. It is the most durable golf hitting mat in the industry and comes with an industry leading 5 year warranty. With the PureShot Ultimate Pure Golf Hitting Mat you can use a real golf tee. There are also 4 holes available so that a rubber tee can be used. If you have any questions regarding the PureShot ULTIMATE PURE Golf Hitting Mat (4'x5'), please give us a call, we would be happy to help you with any questions you may have. 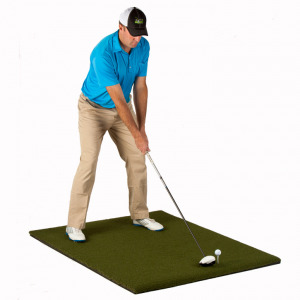 Write an online review on the PureShot ULTIMATE PURE Golf Hitting Mat (4'x5'), and share your thoughts with others.